Sweet children, ask your heart whether you have become a fragrant flower who spreads the fragrance of knowledge. Constantly continue to spread a very good fragrance. Which children's stage remains very intoxicated and what is the basis of galloping? The stage of those who are very good flowers and whose intellects continue to churn knowledge remains very intoxicated. Children remain very cheerful when they give the teachings of knowledge and yoga and spread fragrance. The basis of galloping is to become true moths. Always remain safe from the storms of Maya. Continue to follow shrimat. The Flame has ignited in the gathering for the moths. You living moths heard the song. Whether you are called moths or flowers, it is the same thing. You children understand whether you have truly become moths or those who circle around and go away and forget the Flame. Each one of you has to ask your heart: To what extent have I become a flower and how much fragrance of knowledge do I spread? Have I made anyone else into a flower like myself? You children know that that Father is the Ocean of Knowledge. He has so much fragrance. Those who are good flowers and moths will definitely have a very good fragrance. They will always remain happy. They will make others into flowers or moths, the same as themselves. If not flowers, they will make others into buds. Complete moths are those who die alive and sacrifice themselves, that is, they become the children of God. When a wealthy person adopts a poor child, that child would remember the new parents who have adopted him. He forgets the poor parents. He knows that he has poor parents, but he would remember the wealthy parents from whom he receives wealth. Sannyasis and sages etc. make spiritual endeavour to go to the land of liberation. All of them make effort for liberation but they don't understand the meaning of liberation. Some say that they will merge into the eternal light and others say that they will go beyond to the land of nirvana. To go to the land of nirvana is not merging into the light. You understand that you are the residents of the faraway land. What will you do while living in this dirty world? It is explained to you children that when you meet others, explain to them that this drama is predestined, that there are the golden, silver, copper and iron ages and that this is the confluence age. After the golden age, there is a confluence of the golden and the silver ages. There, the ages change whereas here, the cycle changes. The Father doesn’t come in every age as people believe. The Father says: When everyone becomes tamopradhan and it is the end of the iron age, I come, at the confluence of the cycles. When the age changes, there are two degrees less. When there is the total eclipse of the omens, I come. I do not come in every age. The Father sits here and explains to you moths. Moths are also numberwise. Some sacrifice themselves and others circle around and go away; they are unable to follow shrimat. If you don't follow shrimat, Maya will continue to make you fall. Shrimat is remembered very much. 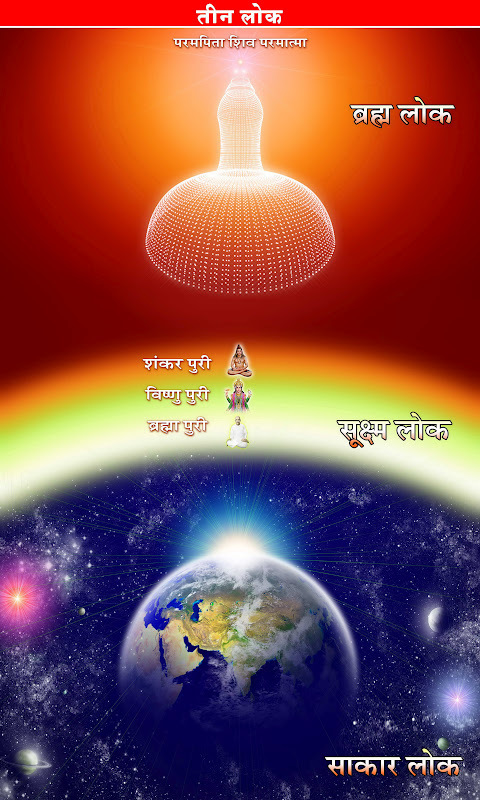 It is said: Shrimad Bhagawad Gita. They later sat and created the scriptures. At that time, because people's intellects were rajo or tamo, they believed that Krishna came in the copper age. The Father says: I come when the deities of the original, eternal, deity religion have disappeared. However, you have forgotten that you belonged to the deity religion. You have said that your religion is the Hindu religion. This is a very severe mistake. Ask the people of Bharat who the worshippers of the deity religion are, which religion they belong to and they would say: We belong to the Hindu religion. Oh! but whom do you worship? The people of Bharat don't know their own religion. This too is fixed in the drama. Only when you forget that do I then once again come and establish the original eternal deity religion. In the golden age there is just the one religion. The Father sits here and explains these things. Those who were the masters of the world have forgotten, so what could you say about the others? This is the only Father who comes and removes you from the land of sorrow and makes you into the masters of the land of happiness. You would say that you are now the masters of hell. The world surely has to become tamopradhan. Everyone is impure and this is why they go in front of those who are pure and bow down to them. Because sannyasis are pure people make them their gurus. They wonder how they would receive salvation if they don't become pure through their guru. However, they don't follow them. The gurus don't even tell them: You are not following us. You are not becoming pure. Here, the Father says: If you become pure and viceless, you are My followers. If you don't become this, you are not My followers. You will not be able to claim a high status. Sannyasis do not say: Follow me, otherwise there will be punishment. The Father says: Follow shrimat, otherwise you will have to cry in a great deal of distress. Those people believe that souls are immune to the effect of action, but that is not so. It is souls that experience happiness and sorrow. No one understands this. Baba repeatedly explains to you: Children, the destination is very high. At this time, you are making effort because you are unhappy. You know that you will remain very happy in the golden age. There, you won’t be aware that you will then have to go to the land of sorrow. You don't know anything about how you came into happiness or how many births you take. You now know who the highest is. Just as God is knowledge-full, so you too are knowledge-full, because you are the children of God. You are now the children of God. Deities are not called the children of God. You are now God’s children, but you are numberwise. Some are very intoxicated: they believe that they continually follow the Father's directions. To the extent that you follow His directions, so you will become elevated. The Father personally sits in front of you and says: Children, become soul conscious! Renounce body consciousness and constantly remember Me alone. However, you won't be able to remember Me all the time. You will be able to remember Me, numberwise, according to the effort you make. However, the results of that will be announced at the end. The Father is the Bestower of Happiness. It isn’t that the Father also causes sorrow. The Father never causes sorrow for the children. Children take sorrow through their wrong behaviour. The Father cannot cause sorrow. Some say: God, give me a child, so that my clan can grow. Children are loved a lot. However, you receive sorrow from your own actions. The Father is now making you children very happy. He says: Follow shrimat. By following devilish dictates, you receive sorrow. Children become unhappy because of not following the orders of the Father, Teacher and their seniors. They themselves become those who cause sorrow; they belong to Maya. Only at this time do you receive directions from God. The results of God’s directions continue for 21 births. You then follow the dictates of Maya for half the cycle. God only comes once and gives you directions. Maya has been in existence for half the cycle and continues to give her directions. By following the dictates of Maya, you become 100% unfortunate. So, good flowers will always remain intoxicated with this happiness. You are numberwise. Some moths belong to the Father and begin to follow shrimat. Generally, the poor write their full account to the Father. The wealthy are afraid that perhaps their wealth will be taken away. It is very difficult for the wealthy. The Father says: I am the Lord of the Poor. Donations are always given to the poor. This refers to Sudama: he gave a handful of rice and was given a palace. You are poor. For instance, if someone has 25 or 50 rupees and he gives one or two annas from that to Baba, it is still equal to a wealthy person who gives 50,000. This is why it is said: The Lord of the Poor. Wealthy ones say that they don't have time. This is because they don't have full faith. You are poor. The poor become happy when they receive wealth. Baba has explained: The poor ones here will become wealthy there and the wealthy ones here will become very poor there. Some ask: Should we be concerned about the yagya or our family? Baba says: Take very good care of your family. It is good that you are poor at this time. If you were wealthy you wouldn't be able to claim your full inheritance from the Father. Sannyasis wouldn’t say this. They would take money and build their own properties. Shiv Baba doesn’t build anything. You children have had these buildings etc. built for yourselves. This is not anyone's property. All of this is temporary, because children have to come and stay here at the end. Our memorial is also here. So, you will come and rest here at the end. Those who remain yogyukt will come running to the Father. They will also receive help. You receive a lot of help from the Father. You know that we have to see destruction while sitting here. Just as Baba entertained all of you at the beginning, in the same way, those who come later also have a right. At that time, you will feel as though you are sitting in Paradise. You will continue to come very close. You understand that you are on a pilgrimage and that after a little while destruction will take place. We will then become princes and princesses. There are all types of flower. Each one of you children has to understand how much fragrance of knowledge you give. Do I give the teachings of knowledge and yoga to anyone? Those who do service remain cheerful internally. Baba knows in which stage they remain and to what extent they will be able to gallop in that stage. Those who have already become moths will be able to gallop in their stage. The Father explains: Storms of Maya will come. Protect yourself from them. Sannyasis never say: Husband and wife have to live at home and remain pure: they cannot inspire such renunciation. Their renunciation is the rajopradhan path of isolation. Human beings have been teaching hatha yoga renunciation to human beings. It is only now that the Supreme Father, the Supreme Soul, comes and teaches Raja Yoga to souls. The soul has knowledge: I, the soul, am explaining to this soul, my brother, just as the Supreme Soul, the Father, explains to us souls, the children. I too am a soul. Baba is teaching me. I then teach you souls. However, because of not having the faith of being souls, they consider themselves to be human beings explaining to human beings. The Father says: I only speak to souls. I, the Supreme Soul, am speaking to you souls. You would say: I, the soul, listen and relate it to souls. If you explain to someone while being soul conscious, that arrow will quickly strike the target. If you yourself are unable to remain soul conscious, you won't be able to inculcate this into anyone. This is a very high destination. It should remain in your intellects that you are listening through those organs. The Father says: I am speaking to you souls. Children say: We souls are speaking to our brothers. The Father says: I am explaining to souls. Baba's order is: Children, become bodiless, that is, become soul conscious. Renounce body consciousness and remember Me. It should enter your intellects that you are speaking to souls and not to bodies. Although someone may be a female, you are speaking to that soul. You children take it for granted that you belong to Baba, but no! Your intellect works in a very subtle way in this. It enters your intellect: I, the soul, am explaining. It isn't that I am explaining to so-and-so. This one is my brother. I have to show him the path. The soul understands this. Only when you have this awareness will the arrow hit the target. When you speak while looking at the body, the soul doesn't hear. First of all, give them a warning: I am speaking to the soul. A soul is neither male nor female. The soul is distinct. The terms male and female are because of the body. Brahma and Saraswati are called male and female, Shankar and Parvati are called male and female, but Shiv Baba is neither male nor female. The Father explains to souls: The destination is very high. Baba's soul is explaining to this one. The soul has to be given an injection for only then will body consciousness break. Otherwise, there isn’t that fragrance or strength. I am speaking to the soul and the soul is listening. The Father says: You have to return home and you must therefore become soul conscious. Manmanabhav! You will then automatically become “Madhyajibhav”. The main thing is “Manmanabhav”. Remember the Father. Although everyone says: Remember God, they don't know Him. They especially say: Remember God. You mustn't remember Krishna or the deities. The intellects of human beings go to Krishna or Rama, but neither of them is God. You children now receive very subtle intellects. Wake up early in the morning and churn knowledge. You have to work during the day because you are karma yogis. It is written: Become conquerors of sleep. Stay awake at night and earn your income. During the day, there is a lot of expansion of Maya. The atmosphere at amrit vela is very good. Children don't write to Baba saying: I wake up at this time and churn the ocean of knowledge. This requires a lot of effort. You are becoming the masters of the world and so you would definitely have to make a little effort. Achcha. 1. Make effort to become soul conscious.I, the soul, am speaking to another soul, my brother. Make firm the practice of the soul speaking and listening through those organs. 2. In order to claim a high status, become pure and viceless. Die alive and become a complete moth. May you be an embodiment of peace who gives the experience of an oasis of peace in the midst of peacelessness and upheaval. When there is an upheaval anywhere, show the wonder of the power of peace at the time of fighting. Let it enter everyone’s intellect that this is an oasis of peace. Be an oasis of peace and spread the power of peace. Be an embodiment of peace and give the experience of an oasis of peace. You cannot serve with words at that time, but you can reveal an oasis of peace by serving with your mind. Let everyone feel the vibrations of being able to receive peace here. Create such an atmosphere. To finish your own worries and the worries of everyone else is to have good wishes for everyone.